Summary: One of the awesome features within the Ziflow application is automated workflows. This feature simplifies the review and approval process by eliminating steps that you would otherwise need to do manually. Available for: Enterprise edition only. Once you upload a proof, it's time to set up the stages. 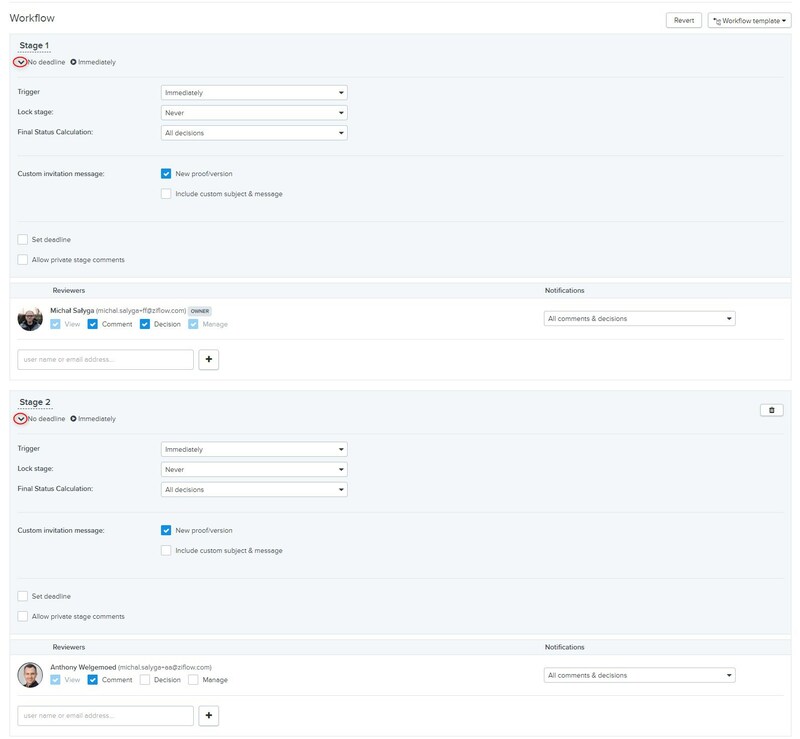 You can choose to configure the stages one by one, or you can take advantage of another great feature on the Enterprise Edition - workflow templates. For now, let's set up the stages one by one. Click on "Stage 1" to change the name to something more fitting to your workflow, such as "Internal Review". Then click on the arrow next to "No deadline" and this will drop down more options (displayed in the screenshot below). Once you've established the settings, add the reviewers for Stage 1. You will also be setting up their email notification preferences. For more detailed information on stage configuration, please see our Creating a New Proof article. After the set-up for Stage 1 is complete, you're going to add Stage 2. Let's assume you want Stage 2 to start when Stage 1 is "Approved". Click the drop down menu next to "Trigger" and select "Starts when" - "Stage 1" - "is Approved". Once Stage 1 is approved, Stage 2 will automatically start and email notifications will be sent to the reviewers. *Note - Stage 2 reviewers are only going to get the most recent version of the proof that has been approved. You can continue to add stages, as needed. There are various types of workflow configurations you can implement.